Yesterday, Camper Van Beethoven released their eighth album La Costa Perdida, and first since 2004. The album is a strong continuation of the band’s latter-era mature material. That is to say a melodic mix of CVB songwriting abilities and eclectic influences delivered with technical proficiency. The band’s traditional mini winter tour took them to NYC for the fifth consecutive January, but first at the new midtown venue Stage 48, a club similar in layout and vibe to the location of the three previous CVB NYC shows, Highline Ballroom, but with more “uptown” feel. While at last year’s show we got a sneak peek at 3 of the new songs, on Saturday night the band played five of the album’s ten tracks, including the single-quality number “Northern California Girls” that we are streaming below. While technically “opening” the show, these co-headline sets with Cracker (recording coming soon) are virtually full length, so the band played seventy minutes of material including quite a number of classics. Camper will continue to tour on the album with shows in the Southeast in January and the West coast in February. This was our first trip to Stage 48. We were quite impressed with the sound quality of the room and the superb quality of this recording reflects the excellent system at Stage 48 and the talents of the venue’s FOH Will. I recorded this set with the Sennheiser cards from the soundboard booth, which is located above the floor but below the balcony and mixed it with a fine board feed. Enjoy! If you download this recording from NYCTaper, we expect that you will PLEASE SUPPORT Camper Van Beethoven, visit their website, and purchase La Costa Perdida directly from the Store at their website [HERE]. Camper Van Beethoven has an extensive catalog dating back almost thirty years to their early 80s formation, which permits the band to play divergent setlists on any given night. But CVB has not released a new album since 2004’s brilliant New Roman Times. So it was a bit of a surprise to hear that Camper has three new fully formed songs that have been played on each night of the current tour, including Saturday night at Highline Ballroom. Of the three, the most impressive was “Too High For The Love-In”, a very Camper-like irreverent and catchy song that we’re streaming below. The balance of the set consisted of a variety of classics culled democratically from each of their albums. The set ended in high form with an energetic take on “Pictures of Matchstick Men” that we are also streaming below. 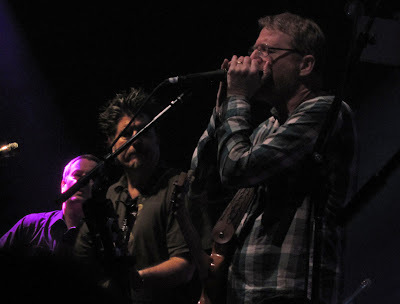 The current tour ended last night in Boston, but Camper Van Beethoven returns to the East coast for another “Camp-Out” Fest, this time at the 40 Watt Club in Athens GA from March 1 through March 3. I recorded this set with the Neumann microphones set up at the front right corner of the soundboard and mixed with an outstanding stereo board feed. The sound quality is superb. Enjoy! The Cracker set was also recorded and will be posted in the coming days. This recording is now available for direct download in FLAC or MP3 at Archive.org [HERE]. If you download this recording from NYCTaper, we expect that you will PLEASE SUPPORT Camper Van Beethoven, visit their website, and purchase their official releases directly from the store at their website [HERE]. This recording is the first submitted by our newest nyctaper staff recorder, “mrsaureus”, who we hope will become a regular contributor! “Like an old testament prophet, or a Morman elder, or (all right, what do I know about it?) 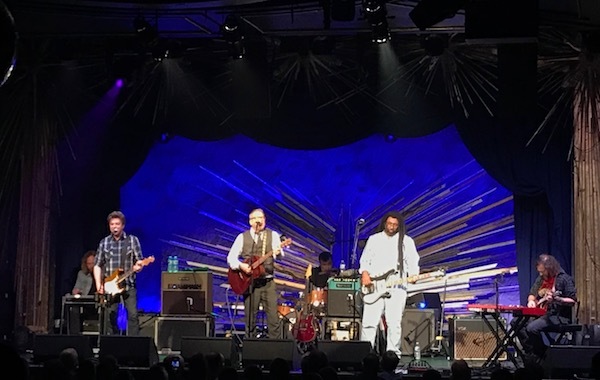 like that guy on Big Love, our favorite openly practicing musical polygamist David Lowery brought both of his bands to NYC for back to back performances at the Highline Ballroom on January 14. I’ve been reading the Keith Richards book, which has me all in a lather for rock and roll tell-all, so I couldn’t help but wonder what the dynamic on the bus is. One big happy family? Hmm. Maybe, but the mind is inevitably drawn to the sordid. Is it Cracker in the front, wearing their greater commercial success like a warm parka, loud and cheerful game of 20 questions, Camper Van Beethoven in the back, sullen and pissy, answering in monosyllables? Or is it CVB the first and truest love, despite Cracker’s headline position on the bill, serenely confident of favor, irritatingly aloof in the face of drunken, bitter Cracker histrionics? I guess we’ll have to wait for the Immergluck book to find out. In the meantime, I marvel at what an absolute delight this pair of shows proved to be. I liked so many things about them I hardly know where to begin. I should say that I was a fan back in the nineties but I’d completely lost touch with this music: all I knew is that I used to like it. As often as not, things you used to love come back to embarrass you (just give me a second to queue up this episode of Lost in Space on Hulu . . . OK, I’m back now), and so I was gratified and relieved to find that in this case my taste was vindicated by strong performances of a jaw droppingly rich musical smorgasbord. It’s a brilliant format, playing consecutively as CVB and Cracker, and it gives the concert goer some real insights into the different approaches taken by these two successful projects. I found myself about to use the word “evolution” back there, but that isn’t it: CVB didn’t evolve into Cracker anymore than the Beatles evolved into Wings. Two bands. Some similarities. Some differences. Both draw on a rich California compost heap of musical influences (the Dead, Bakersfield, Cali ska) and have a sound founded on solid musicianship and terrific guitar work. I was struck by how really well both Greg Lisher and Johnny Hickman played. CVB is fermented longer and a little bit tangier and is in some ways more interesting musically, where Cracker is more buffed up alpha pop, steroids sure, but hits the home runs fair enough. Both bands sounded absolutely fresh: no taint of the nostalgia act here despite playing sets consisting almost wholly of albums recorded 20 years ago. So, yeah, this show was constructed around the “play the whole album” gimmick, which is becoming increasingly common, and about which I have a certain shallow ambivalence. Upside, you know you’ll hear songs you like. Downside, it panders to a lack of faith in the fanbase. It’s the same impulse that’s turning Broadway into a recycling center for popular middlebrow movies. It seeks to assure the public that even if they are disappointed, at least they won’t be surprised. A concert can be a revelation. A live show allows a band to play their songs reworked in interesting ways, to add intros and codas and fool with the mix of instruments and the tempo, to play covers and obscure tracks. They can petulantly refuse to play their big hit, or play it so flaccidly it’s like a big contemptuous finger to the audience (this I don’t like), or going the other way they can play their big hit twice: once early and once again at the end. I’ve seen all that and every time it makes me glad I didn’t just stay home and listen to the album. Or they can just play the album, which in general teaches me less. Gosh, I’m whining and I don’t like it, and it strikes me that in this case at least, I’m being a bit of a bad sport. Having to listen to Key Lime Pie and Kerosene Hat, both in my top ten list of all time favorites, is really nothing to complain about. Recorded and minimally produced by mrsaureus, standing center floor five feet back from the stage, Core-Sound High End Binaurals to Sony PCM-M10 (48 kHZ, 24 bit), WavePad Sound Editor to chop and FLAC only. Some crowd noise but sounds nice. The Cracker recording will posted shortly in a separate post, with reference to the same review.